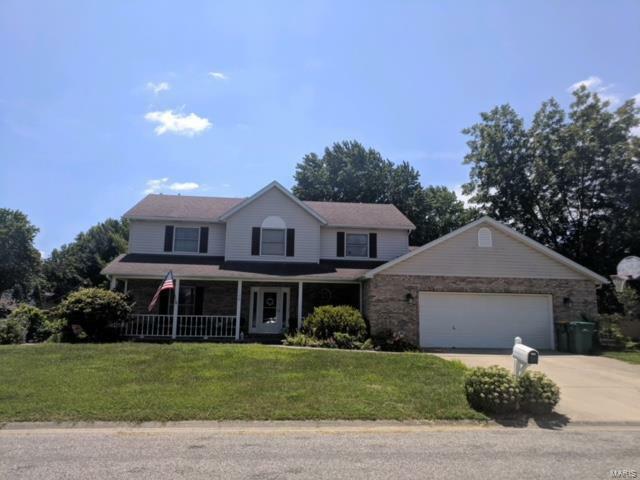 Fall in love with this pristine home in prime location in Mascoutah! Walking distance to middle school, high school, park and swimming pool! Enjoy a cup of coffee on your front porch and take in the calm neighborhood and watch kids play! This perfect family home has 4 large bedrooms with custom closets, a master suite with vaulted ceiling, master bath with jetted tub and dual vanities and a huge walk in closet. The first floor is perfect for today's modern family with an open floor plan, updated kitchen and family room with skylights and fireplace. This great space continues outside as it opens to a covered deck overlooking the level backyard. Even more rec room in the partially finished basement with 9 ft ceilings, complete with pool table and built ins. Basement also includes storage and a bonus room that can be used as wine cellar or safe room. Newer commercial water heater, sump pump, huge 3 car garage with oversize two car garage door are just a few of the extras you will find!